Alpha-Link MX 16-4, Analog/Digital Converter from SSL. Solid State Logic announces the launch of Alpha-Link MX. Alpha-Link MX is the first of a new generation of SSL A-D/D-A converters. The new generation SSL converters are based on the larger Alpha-Link SX and AX models. The Alpha-Link MX range consists of two different 1 U units that can be used individually or combined to create larger systems. Each unit features 64 channel digital audio I/O via Fibre Optic MADI In/Out connections which can be used to connect to a suitably equipped MADI device including SSL’s own MadiXtreme, MX4 andDelta-Link computer audio interfaces, or to cascade multiple MX units. The ‘Alpha-Link MX 16-4’ has 16 analogue inputs and 4 analogue outputs, making it a 16 channel capture device with 4 outputs for artist and studio monitoring. The ‘Alpha-Link MX 4-16’ has 4 analogue inputs and 16 analogue outputs, making it a solution for 16 channel analogue summing with 4 channels of audio capture. Up to four MX units can be cascaded in any combination in a daisy chain. In this way systems with up to 80 analogue connections which are routable to a single 64 channel MADI In/Out connection can be created. MX units have a switchable reference level to enable matching with the rest of your studio system, with a range of settings between +24dB and +14dB. Alpha-Link MX units are configured via a set of front panel controls with status indicator LED’s providing status and level information. 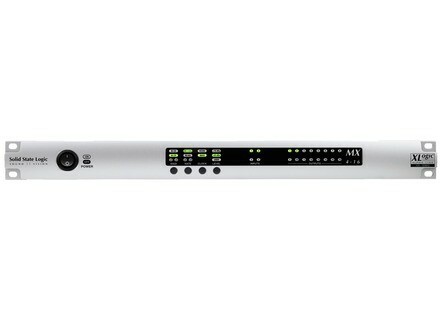 Alpha-Link MX units are available bundled with an SSL MadiXtreme 64 Mac or PC audio interface. Alpha-Link MX is available now from SSL Resellers worldwide. Visit www.solidstatelogic.com for more details. TC Electronic DB-4 & DB-8 MKII Updated The 3.40 upgrade includes a new Advanced Loudness Correction processor, ALC6, and LKFS reading for the Radar Loudness Meter, LM6. Moog MF-104M Analog Delay The MF-104M recreates the sound and vibe of the Classic MF-104. Aphex EX·BB 500 Module Aphex has launched the EX•BB 500 module, featuring the company’s Aural Exciter and Big Bottom audio enhancement technologies.